But Hand is no believer in superstitions, prophecies, or the paranormal. His definition of 'miracle' is thoroughly rational. No mystical or supernatural explanation is necessary to understand why someone is lucky enough to win the lottery twice, or is destined to be hit by lightning three times and still survive. All we need, Hand argues, is a firm grounding in a powerful set of laws: the laws of inevitability, of truly large numbers, of selection, of the probability lever, and of near enough. Together, these constitute Hand's groundbreaking Improbability Principle. And together, they explain why we should not be so surprised to bump into a friend in a foreign country, or to come across the same unfamiliar word four times in one day. Hand wrestles with seemingly less explicable questions as well: what the Bible and Shakespeare have in common, why financial crashes are par for the course, and why lightning does strike the same place (and the same person) twice. 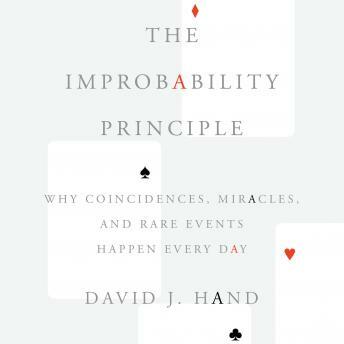 Along the way, he teaches us how to use the Improbability Principle in our own lives-including how to cash in at a casino and how to recognize when a medicine is truly effective. An irresistible adventure into the laws behind 'chance' moments and a trusty guide for understanding the world and universe we live in, The Improbability Principle will transform how you think about serendipity and luck, whether it's in the world of business and finance or you're merely sitting in your backyard, tossing a ball into the air and wondering where it will land.